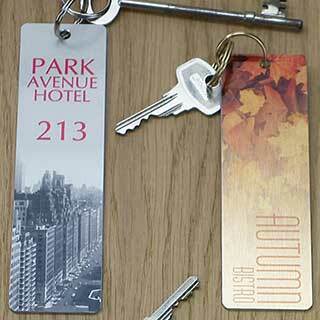 We supply a wide range of hotel key tags in various shapes, sizes, colours and materials. 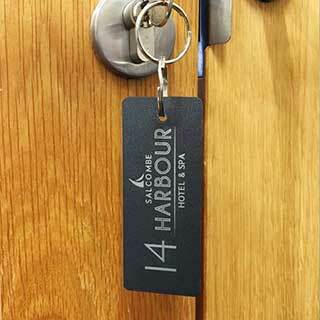 Our ABS plastic key tags can be produced in a variety of ways to include hotel room names or numbers along with a corporate logo or design. 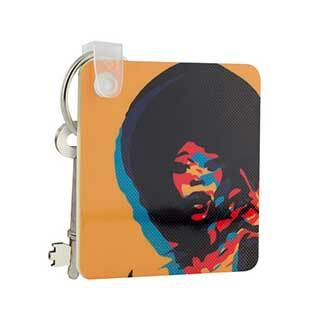 A slimline metal key tag can be printed in vibrant full colour on either one of two sides. Available in rectangle, oval and round shapes. Choice of background colour brushed gold, brushed silver or white. Choice of gold or silver rings. Set up charge of £30.00 (Subject to sight of artwork). 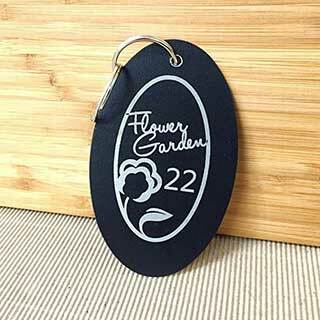 Standard numbers can be printed in black on gold, silver or white free of charge (No logo). Your choice of numbers. This chunky solid wooden key tag range takes style and individuality to another level. 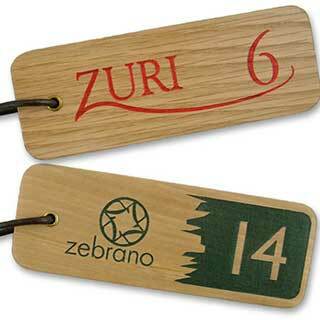 With a smooth finish each wooden key tag is hand crafted and engraved to the highest standard. Choice of 2 quality wood finishes Dark Oak or Light Oak. Two sizes available - Oval 100 x 55mm or Rectangular 125 x 40mm. Standard numbers engraved on one side included in price. 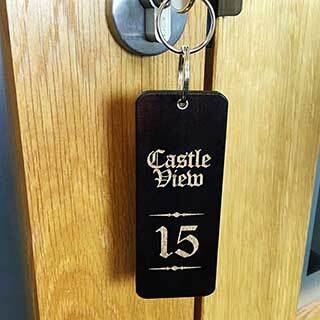 To personalise the key tags with logos, names and room names there is a £25.00 one-off set-up charge. Minimum quantity 10. Please note that because of the small engraving area on these key tags, small text and complicated logos will not engrave properly. Choice of leather or silver or gold ring key tag fixing. Choice of 2 quality wood finishes Dark Oak or Light Oak. Many infill colours are available for engraved wood. 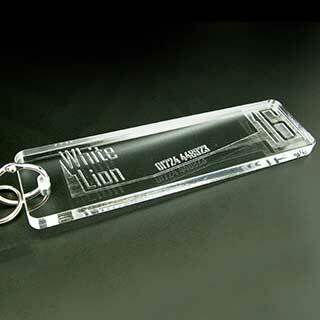 Strong and durable clear acrylic rectangle key tags that can be engraved on one side to your requirements. We also offer a number only option where you can choose from three complimentary fonts. The acrylic key tags are available in a choice of three sizes in two shapes, oval and rectangular..
Can be engraved with your text or logo. One-off origination charge for personalisation £25.00. Three sizes available - 4" Oval, 4" Rectangular or 6" Rectangular. Choice of gold or silver rings. Also available in oval shape. Minimum quantity 10. 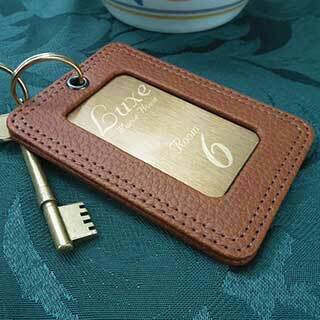 Choice of leather or silver or gold ring key tag fixing. Many infill colours are available for engraved wood. Faux leather key tag made from textured tan faux leather with a metal plate that can be personalised in full colour print inset into the faux leather. 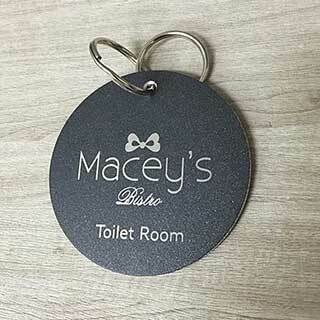 The key tags are available in black or tan faux leather or charcoal wood effect with a choice of metal plate in silver, gold or white, printed with your own design. One off setup cost £25. Single sided only. Metal printed plate framed with black faux leather, tan faux leather or charcoal wood effect. Choice of gold or silver rings. 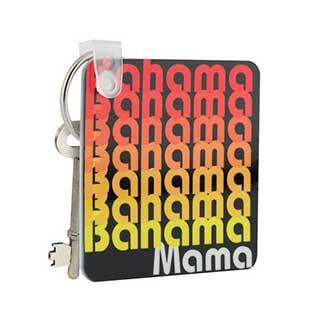 A strong and durable acrylic rectangle key tag that can be printed on one side in full colour to your requirements. There is a choice of three shapes - Square 58mm, Round 63mm and Rectangle 75 x 30mm. Single side printed only. Can be printed with your own full colour logo. White acrylic. Choice of gold or silver rings. 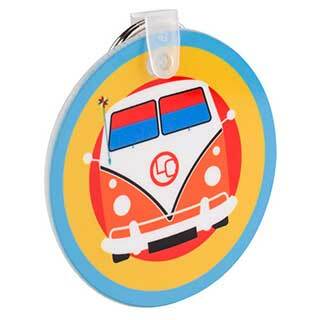 Key tag can be printed in full colour with your own design. One off set up cost £25. Minimum quantity 10. 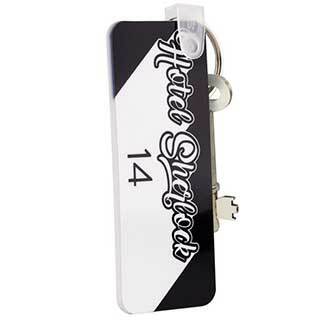 A strong and durable white acrylic personalised key tag that can be printed on one side in full colour to your own requirements. There is a choice of various sizes and shapes. There is a choice of sizes and shapes. Round – 63mm, Square – 58mm, Rectangle – 75 x 30mm. Gold or silver ring fixings available. Minimum quantity 10 key tags. Full Colour Design - Available in gold, silver or white printed with your design - One off setup cost £25. Standard Numbers printed free - Available in white printed in black with your choice of numbers. Durable metal rectangle key tags made from scratch resistant metal and can be engraved with your own design, text or logo. Now made from a single sheet of 2mm aluminium which is even more robust and will stand up to the toughest use. Available in three contemporary colours to match your décor, which include black, graphite and silver. Three standard sizes are available including rectangular, round and oval shapes. Minimum quantity 10. 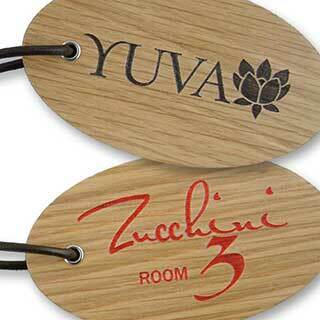 These stylish key tags are sure to impress your guests with their quality. These metal key tags can be engraved on either one or two sides. Engraving reveals the silver metal underneath. Engrave your logo or design for a one off setup cost £25. Also available in round and oval shapes. Gold or silver rings can be used. Bespoke sizes can be made, please contact us for a quotation. 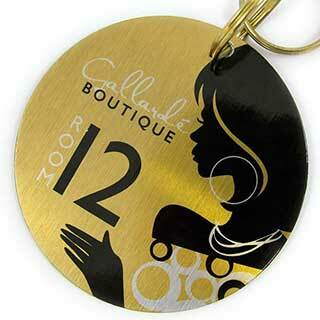 Durable metal oval key tags made from scratch resistant metal and can be engraved with your own design, text or logo. Now made from a single sheet of 2mm aluminium which is even more robust and will stand up to the toughest use. These stylish key tags are sure to impress your guests with their quality. These metal key tags can be engraved on either one or two sides. Engraving reveals the silver metal underneath. 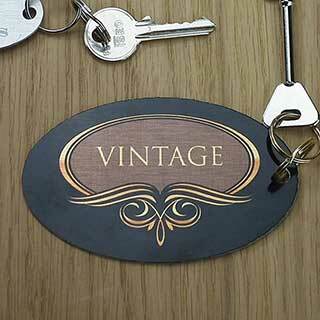 Engrave your logo or design for a one off set-up charge £25. Also available in rectangle and round shapes. Gold or silver rings can be used. Bespoke sizes can be made, please contact us for a quotation. Durable metal round key tags made from scratch resistant metal and can be engraved with your own design, text or logo. Now made from a single sheet of 2mm aluminium which is even more robust and will stand up to the toughest use. Also available in rectangle and oval shapes. Gold or silver rings can be used. Bespoke sizes can be made, please contact us for a quotation. 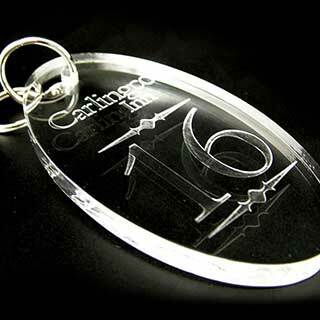 Strong and durable clear acrylic oval key tags that can be engraved on one side to your requirements. We also offer a number only option where you can choose from three complimentary fonts. 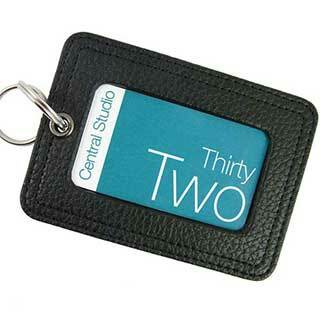 The acrylic key tags are available in a choice of three sizes in two shapes, oval and rectangular. Also available in rectangle shape in two sizes. Minimum quantity 10. Faux leather key tag made from black textured faux leather with a metal plate that can be personalised in full colour print inset into the faux leather. 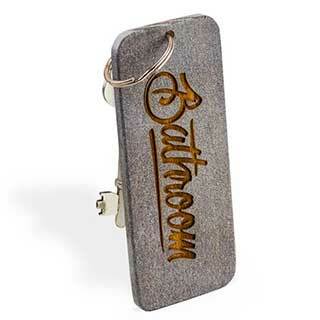 The key tags are available in black or tan faux leather or charcoal wood effect with a choice of metal plate in silver, gold or white, printed with your own design. One off set-up cost £25. Faux leather key tag made from textured charcoal wood effect faux leather with a metal plate that can be personalised in full colour print inset into the faux leather. Standard Metal Plate with no personalisation (Free) Available in gold, silver or white printed in black with your choice of numbers. Minimum quantity 10. A strong and durable square acrylic key tag that can be printed one side in full colour to your requirements. A strong and durable round acrylic key tag that can be printed one side in full colour to your requirements. A stylish engraved wooden key tag with a unique smooth finish. Three wood finshes are available, dark wood, grey wood and light wood. Available in one size only 127x50mm (5") rectangle with either gold or silver ring fixings. Your own logo or design can be engraved on one or two sides with options for free standard engraved numbers. Engraving allows the natural colour of wood to show through. Your own design can be engraved One off set up cost £25. Standard Numbers (Free) - Choose from 3 different fonts. Numbers of your choice.